Historically one of the biggest costs associated with starting a small business has been getting an office building up and running. Not every office has to be an ultra modern suite in the newest glassy skyscraper, but, until recently, every business has needed some place to set up headquarters. With overhead costs like rent, desks, and computers, many great business ideas have been left at home because of the would-be entrepreneur’s inability to secure the sizeable funding required to lock down and prepare and office. These shackles of business are starting to come off for many small businesses. New consumer trends like street food and internet marketplaces are creating opportunities for many entrepreneurs to get their start without investing in a brick and mortar store. Above and beyond this, some small businesses are finding ways to manage large teams of 100+ employees without ever bringing their staff into an office. New developments in the way that we work are changing the small business landscape for the better. Here’s what you need to know. Since the very first white-collar jobs began to appear in the 20th Century, managers have been honing office design with one purpose in mind: creating the best possible workspace so that employees can achieve maximum productivity at minimal cost. In the 1950s and ‘60s, the cubicle was meant to shut employees off from distractions, allowing them to focus on work and avoid unproductive social situations without forcing the company to spend additional money on individual offices. 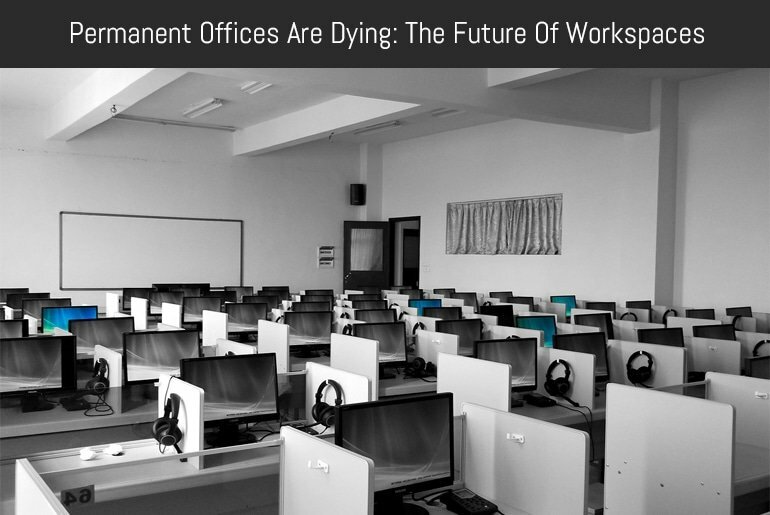 In recent decades, the cubicle has been left behind. Employers are finding that open office layouts and casual dress codes help to foster cooperation and good social standing between employees. The next development will involve ditching the office altogether. More and more companies are beginning to offer flextime options for employees. Flextime is when an employee can do their job in the environment of their choosing. Managers are putting workplace decision in the hands of employees with the assumption that each worker knows where they are liable to do their best work. This trend recognizes the diversity in the workforce — some employees thrive on energetic, crowded workspaces. Collaboration helps them to stay excited about their own projects. For these workers, the right kind of mental break involves dipping into a coworker’s problems and working together to find a solution. Other employees are more introverted, however, and have shied away from open offices because of their introversion. These workers are able to work from home or in a quiet library, free from distractions and able to zero in on the problems that they are working on. The flexible workspace is made possible by recent advancements in communications technology. Cloud computing helps workers keep critical documents online, where they can be accessed from a workspace anywhere in the world. Technology like inflight texting means that there is nowhere on land or in the sky that is off-limits to the inventive flex worker. When employees aren’t tied down to a particular desk in a particular office, there are some great benefits for the small businesses that employ them. The most obvious might be saving money on overhead costs. When employees can be trusted to work independently, it no longer becomes necessary to maintain a permanent workspace for them. For some businesses, this might mean moving into a smaller workspace and saving money on rent and hardware. For a few rare businesses, however, it may make the permanent office disappear altogether. As we mentioned above, individual employees often know how to create the conditions under which they can be most productive. Some employees thrive in loud environments while other prefer the faint chirping of birds and other natural sounds in the background while they work. The point is that no two employees are liable to work at their very best under the same conditions. By enabling these workers to design their own workspaces, managers can be sure that employees are going to be at their happiest. High morale and productivity often go together, so companies would be wise to keep workers happy. The modern workspace is moving beyond cubicle, open office layouts, and other forms of permanent office space. Instead, the future embraces the differences between employees. Flextime can help companies cut down on spending and help workers to create their own perfect working conditions. Nick Cesare is a professional violist and freelance writer. When he’s not practicing he loves to cook healthy food and go rock climbing. You can reach Nick with any questions or comments @cesare_nick.